I coauthored this article, published in NACLA Report on the Americas, with Joseph Nevins. In the fall of 2016, Donald Trump’s “big, beautiful wall” along the U.S.-Mexico divide seemed like an unlikely presidential candidate’s campaign bluster. Since the New York real estate magnate’s swearing-in as Barack Obama’s White House successor on January 20, 2017, it is now a serious Executive Branch threat. Only five days after the inauguration, the Tweeter-in-Chief signed an executive order requiring “the immediate construction of a physical wall on the southern border.” It is to be one “monitored and supported by adequate personnel so as to prevent illegal immigration, drug and human trafficking, and acts of terrorism.” According to the administration’s official request for proposals, released on March 17, the wall should be “physically imposing in height”—about 30 feet high but certainly not less than 18 feet. The new administration’s walled hopes and dreams face considerable obstacles. Among them are the fact that most people in the United States are opposed to building the new barrier, particularly one with a price tag of somewhere between $15 and $40 billion USD— or somewhere between 101 and 270 times the National Endowment for the Arts’ annual budget, estimates Carolina Miranda in the Los Angeles Times. According to an Associated Press-NORC Center for Public Affairs poll in early April, only 28 percent of respondents support new spending for the border wall, with 58 percent against. The results are consistent with findings of a Quinnipiac survey from February. It found that 59 percent of voters opposed the construction of Trump’s wall, with 39 percent in favor; the gap only grew when voters were asked their opinions of the project if U.S. taxpayers had to finance it. In addition, and perhaps most significant, is the matter of property. Most of the already-existing walls and fencing stand on federally-owned land. Much of the rest of the land where Trump’s Great Wall would be built is either privately-held or owned by Native tribes. Given this fact, the Trump administration will have a big legal battle on its hands that could involve years of litigation, predicts University of Pittsburgh law professor Gerald Dickinson in the Washington Post. Regardless of the outcome of Trump’s plans for the wall along the actual international boundary line, it is but one part of a gigantic enforcement regime, one that already is comprised of approximately 18,000 Border Patrol agents in the Southwest borderlands alone (out of a total of roughly 22,000 agents nationally). The U.S.-Mexico borderlands is also already littered with several hundred miles of barricades—in the form of walls, fences, and low-lying vehicle barriers—almost all of which were constructed since the mid-1990s, across administrations, both Democratic and Republican. In some of the most urbanized stretches along the international divide, double-layered barriers exist. In and around San Diego, for example, a corrugated metal wall is paired with a steel mesh fence, portions of which are topped with concertina wire. 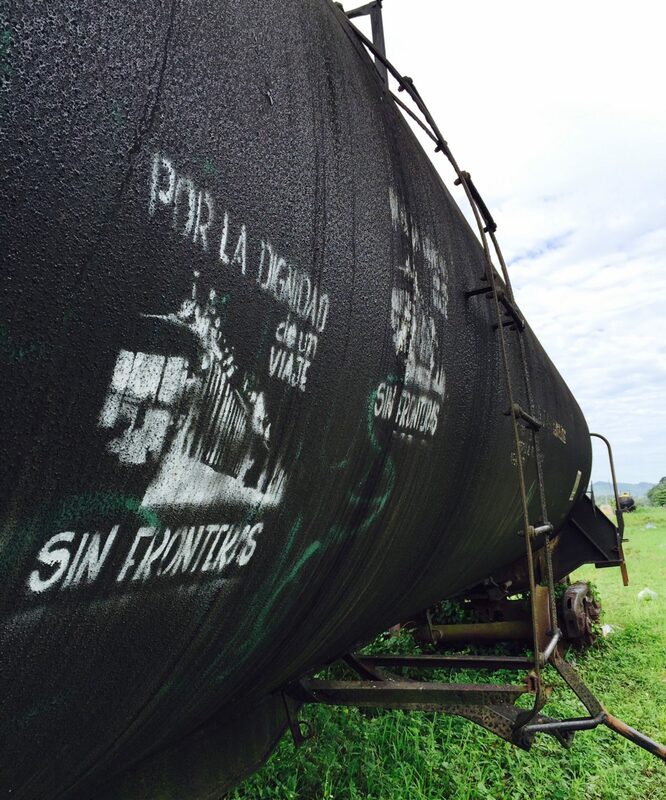 Moreover, the apparatus of exclusion goes far beyond the actual U.S.-Mexico divide. It includes a 100-mile-wide “border zone” inside the territorial perimeter of the United States, an area in which U.S. Customs and Border Protection (CBP) has certain extra-constitutional powers, such as the authority to set up immigration checkpoints. And there is also the interior policing apparatus run by Immigration and Customs Enforcement (ICE), an agency with about 5,800 deportation officers, a force that Trump seeks to almost triple in size. Before even setting foot in the White House, Trump already had the largest border enforcement apparatus in U.S. history at his disposal. And with the definition of “operational control” for that apparatus altered in Trump’s January 2017 Border Security Executive Order—it now reads the “prevention of all unlawful entries” (emphasis added) into the United States—there is an anticipation of another massive border policing build-up. This build-up will not only be at the Mexico-U.S. international boundary line, nor will it simply be within the United States’ own national territory. Rather, under Trump, we can expect an expansion of the apparatus of exclusion beyond the country’s official territorial boundaries. As then head of the U.S. Border Patrol Mike Fisher explained before the House Committee on Homeland Security in 2011, “The international boundary is no longer the first or last line of defense, but one of many.” This means there is not only an internal thickening of the border policing apparatus within the United States, but also a multilayered, extraterritorial extension of the border. “The U.S. border starts at Guatemala now,” Daniel Ojalvo, a staff member at a migrant shelter in the Mexican state of Oaxaca, told a reporter from In These Times in 2015. In other words, greater efforts to stop migrants in southern Mexico and in Guatemala precede the Trump administration; in many ways, they are the product of Obama administration policies. With General John Kelly, the former head of U.S. Southern Command (SOUTHCOM), now at the helm of the Department of Homeland Security (DHS), it is reasonable to expect such boundary “thickening” efforts—wall-building of a sort that rarely gets attention—to grow. This article was published in NACLA Report on the Americas and you can read the rest here. El mensaje central de la campaña presidencial de Donald Trump era que iba aconstruir un muro entre Esta- dos Unidos y México, un muro grande, un muro “hermoso”. Pero el secreto a voces es que el actual presidente de Estados Unidos no va a construir tal muro, solamente algunas secciones de varios tamaños a lo largo de la frontera. En primer lugar, como ya saben muchos mexi- canos que han ido a Estados Unidos sin documentos, un muro fronterizo de aproximadamente 1100 kilóme- tros ya existe entre los dos países (la línea es 3200 kilómetros aproxima- damente). La mayor parte del muro fue construido después de la “Secure Fence Act of 2006”. En segundo lugar, parte de la estra- tegia actual que tiene la migra en la frontera es esa de concentrar muros, agentes, y tecnología de vigilancia en los lugares mas “fáciles” de cru- zar la frontera para migrantes sin documentos. Así que a la fuerza mi- grantes van a los desiertos hostiles donde se tiene que caminar por lo menos tres días (y tal vez mas), y no se puede llevar la su ciente agua. Se han encontrado los restos de mas de 6,000 personas desde que fue imple- mentada esta estrategia en los años 90’s. Read the rest here on the Edible Baja Arizona website where it was originally published accompanied by the gorgeous photography of Jeff Smith. Read the rest at TomDispatch, where it was originally published. On the U.S.-Mexico border, the border security industry grows alongside the expanding militarization of the drug wars. “Join Abby Martin as she investigates why there are thousands of bodies on the US Mexico border–and uncovers a hidden war–in this full-length documentary, originally aired as a two-part series. This was originally published in the Tucson Weekly. When you read this it will be 2050. Right now you are seven months in the womb. When I see you now—your heart thumping in colorless ultrasounds—I am mesmerized by your beauty, your innocence, your potential. I know that by the time you read this you will have seen a lot, you will have seen too much. In 2015, my child, we hear a lot of climate predictions for what the world will be like in 2050; these forecasts are frightening. For example, the common projection for climate refugees—people on the move due to hellacious typhoons or hurricanes, rapid sea level rise, or disastrous droughts—is 200 million. But who would’ve known, as long ago as 2015, that Arizonans would be among the uprooted? Nobody was expecting the semi-collapse of Phoenix, though the city was, along with Tucson, already in trouble. Both cities were rationing water and battling ever-more tenacious wildfires. When a fierce dust storm knocked out Phoenix’s electricity grid in June of 2040, and the air conditioning didn’t come back on, ever, for many it was the last straw. It wasn’t the first migration out of the city, but it was the largest. What people weren’t expecting, however, were the Homeland Security checkpoints around U.S. cities and between state borders, or the new laws that only permitted people with certain documents to travel. And, of course, the subsequent arrests, incarcerations, and deportations if those laws were not heeded. But I write you, my child, before all this happened. I write to you from Paris, in November of 2015. I write to you one week from what many are saying is the most important climate summit in history. I write you in the hopes that I am wrong, because we all know there is a much better world possible and it’s still in our grasp. It’s critical, I think, for you to understand where I am right now. Two weeks before the climate summit began, coordinated violent attacks across Paris dramatically altered the tone of the negotiations. The French government “cancelled” the marches, which were to be attended by varied international organizations that would put formidable grass roots pressure on participating nations. The government said they couldn’t provide sufficient protection to the organizers, though the best protection for them—and for you, my child as we now see—would have been to embrace that more urgent conversation that demanded a better world. The impacts of the Paris attacks spanned the globe. In the United States, for example, most politicians barked about military operations and let this critical moment for the climate fall to the wayside. The fires of xenophobia were fanned all the way to the upper-echelons of government, conflagrating all across the media landscape. Witnessing this rapid mobilization of the counterterrorism hawks just seemed to prove that, if that were the impetus, we could move just as forcefully to protect the climate. But, no. A slightly-reformed yet catastrophic “business as usual” strategy carried on; we guaranteed your frightening reality. For the astute contemporary historians in 2050, they will see that the calls for more border militarization in 2015 had already been happening for some time. The U.S. military and Border Patrol were already preparing for what official documents called “mass migration” due to climate destabilization. That’s why there are all the checkpoints now, on the I-10 between Tucson and Phoenix, entering Phoenix, entering California. I know you don’t like them; we didn’t like them either. As I sit in Paris right now in 2015, your future, I am deeply saddened to say, looks bleak. But I have a feeling that I am wrong. Maybe I have overestimated the trends of the power structure, and underestimated the strength of the people. Maybe it’s you, my beloved, that gives me hope. Maybe I see in your potential actions, in your imagination, in your creativity, and in your capability the seeds for a much happier world. It is clear that your vibrant generation will be forced to act. It will have to reach across these fortified borders, and refuse to submit to them. It will take this sort of unity. This is where I place my greatest hope. Read the rest here on nacla.org, where it was originally published. See the video of an interview I did with Mike McCormick in Seattle last April here.